I admit it. I’m totally in love with the subscription box concept. Whether it’s pet treats for Chester or cool nerd stuff for my husband, it’s such a fun surprise to see what we’ll get every month. I just hadn’t found the perfect book-focused one until Ever After Box. See, I’m a romance reader. I’m not that interested in YA or general fiction or anything else and Ever After Box is ALL ROMANCE. Each month’s box has a different theme and contains at least one book plus 3-5 gift items. You can check out the contents of their COFFEE themed box here. The theme of February’s box is SWEET TOOTH and I collaborated with historical romance writer Rose Lerner to contribute! Here’s the best part: I have a free box to give away to one lucky reader! Check out the Rafflecopter giveaway below to win a coupon code for either the SWEET TOOTH box or to sign up for a monthly subscription and get your first box free. Or if you don’t want to wait, you can use code SWEET10 at checkout right now to receive $3 off your February box. Sorry, international romance fans. 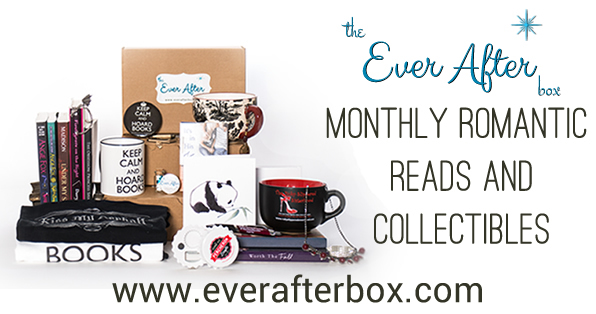 This giveaway and Ever After Box are currently only open to US residents at this time. Enter before midnight EST on 2/17/16. Oh, wow! I haven’t heard of this subscription site before. Off to check it out! This looks amazing! I’d love to try a subscription like this. That’s a good point! I read mostly ebooks too. I asked Jeannie Lin, who’s the mastermind behind this whole thing and she said there are both print and ebooks in the box. Ebooks are typically via download codes. Well… Then now I have to give it all my money. Thanks for checking on that! I’ve never heard of this, but I’m sure if you and Rose Lerner collaborated it will be grand! Thanks for sharing —I’m tempted. This looks great! I have not tried any subscription boxes yet, though they’ve become quiet popular. I love all the book-themed stuff in the picture! This is a fun idea for a giveaway. Thank you so much! I just checked my email this morning and learned I won the Ever After Sweet Tooth box! I guess I can never claim I never win anything anymore, huh? But that’s a good thing, I think. Again, thanks so much to both you and Rose Lerner for this giveaway. I’m sure it’s going to be wonderful!